One lucky Winnipeg man is $1 million richer — all thanks to Patrik Laine. 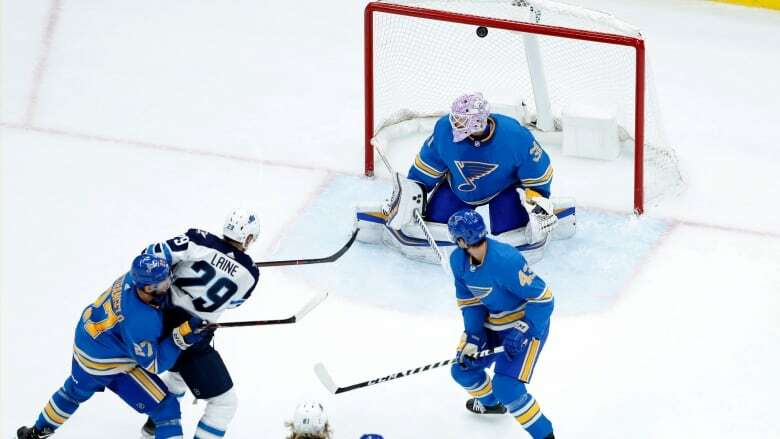 Laine scored a very rare five goals against the St. Louis Blues on Saturday night. A five-goal game means a Million Dollar prize through Safeway/Sobey's Score & Win contest plus $100,000 for the fourth goal, and $1,000 in gift cards for the third goal, for whoever is in the draw that night. On Saturday, that happened to be Christopher Haley of Winnipeg, the company tweeted Saturday night. What a night for <a href="https://twitter.com/PatrikLaine29?ref_src=twsrc%5Etfw">@PatrikLaine29</a> and Christopher Haley of Winnipeg.<br><br>A 5 goal game means a Million Dollar prize, plus $100,000 for the 4th goal &amp; $1,000 in Gift Cards for the 3rd goal.<br><br>We have been in contact with Christopher this evening.<br><br>Congratulations from Sobeys Safeway! Laine's five-goal game is only the 61st in NHL history. The last player to score five goals in a game was Johan Franzen of the Detroit Red Wings on Feb. 2, 2011. Darryl Sittler of the Toronto Maple Leafs was the last player to score six goals in a game, on Feb. 7, 1976, against Boston. CBC has attempted to reach Haley for comment and will update this story if we receive a response.